The coach left at 6am, which meant that we could get stuck into the lagers bright and early - like 6:05. A cracking way to start the day. That stupidly early start time got us to Milton Keynes - a journey of just 40 miles - by 8am. Luckily, a handy slab of lager whiled away the hours until the gates opened. Despite this - or perhaps because of it - we still managed to miss openers Raging Speedhorn. Still, it would hardly be a festival if you didn't miss at least one band you were interested in seeing. Luckily we also missed Union Underground, Apartment 26 and (hed) PE - all of whom, we were later told, sucked. We arrived in the arena just in time to see Pure Rubbish, who were anything but. The day's only true rock n roll band and much much better than some of the dire nu-metal sludge that followed. Still, when there's crap music on it's a perfect excuse - if one were needed - to get more beer inside you. So that's what we did straight after Pure Rubbish. The kangaroo boxing in the centre of the arena took our fancy, but we couldn't talk Dan into it - mostly as he sussed out we all wanted to punch him. And we were getting far too pissed to puch straight anyway. Soulfly were a major disappointment. The Milton Keynes sound didn't help them at all. Perhaps they don't come across well outdoors. Perhaps they just don't like outdoors. The Kerrang! Stage featured a whole load of sorry shite for the rest of the day. Papa Roach on the main stage were dull, too, but then Tool gave things a bit of a lift. One of the high points of the day - despite the singer being onstage in just his trolleys. 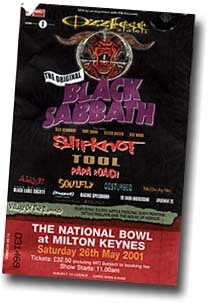 It looked like more people had come for Slipknot than Sabbath, but they were dull where they had been amazing at Reading the summer before. Apparently they played a whole load of new songs, but they all sounded exactly the same as the old ones. And still they give it all that Bon Jovi-style talking to the crowd crap, too - shut up, won't you! Dan found them so disagreeable that he had a kip during their set, and there's not a lot of people can say they've done that. The crowd thinned out before Sabbath as the kids went home and the old folks struggled to stand up. It was well worth the struggle - Sabbath were as awesome as they'd been dull three years earlier. Despite their expanding waistlines there wasn't a hint of flabbiness in their playing as they tore through most of their classics to close with a storming "Children of the Grave". Dan told me this - I only know three songs, but they rocked. Like big, mad fish. Fireworks rounded off the night before a desperate search for more booze. The bars had shut, but Wigg sweet-talked the young lady on the wine stall into selling us a couple of glasses even though they were closed. And then he spilt most of it all over himself back on the coach.